Laura Lake and the Hipster Weddings is a romp of a book that really could have you laughing out loud as you follow Laura and the funny situations she gets into as she investigates celebrity weddings. Laura longs to be a serious investigative journalist, following in her late father’s footsteps. When she is offered the chance of an internship at a glossy magazine in London she jumps at the chance. Things don’t go quite as she expected though, not helped by the fact that her arch-enemy who bullied her at school, Clemency, also works at the magazine. If ever there was someone misnamed, it is Clemency! It took me a wee while to get into the story at first but from when Laura moved from Paris to London, I was hooked. Through an unfortunate combination of circumstances, she is left stranded in London with no money, no phone and nowhere to stay. I couldn’t help but feel for her, as she really thought this was her big chance and everything that could go wrong, had gone wrong. I had to admire her resourcefulness as she tried to find a way out of her situation. I must say that I really hope that the glossy magazine industry and the celebrity culture it reports on isn’t as shallow as it appears in this book. The weddings that Laura attended were truly awful though did provide many really funny moments. The ‘ironic’ wedding taking place in a public loo was truly hilarious for many reasons. Many of the ‘celebrities’ attending the weddings had names suspiciously similar to real people and I had fun guessing who they were possibly meant to be. There were certainly some memorable characters throughout the book from the rap star with a secret fondness for crafting to Lulu, a socialite famous for being famous. Lulu provided some of the funniest lines in the book as she often made mistakes with her words and I certainly snorted out loud when I read that what she wanted more than anything was happiness. Now that may not sound funny but when you read that part of the book you’ll know what I mean! Lulu’s butler Vlad was also an unforgettable addition to the story. As well as Laura researching the weddings, there was also a mystery regarding her father’s death which isn’t resolved in this book, the small matter of a jewel thief targeting the weddings and just what was mysterious reporter Harry Scott working on? No doubt some of these will be resolved in the next book to feature Laura (Laura Lake and the Celebrity Meltdown due out in 2018) and if it’s as entertaining and witty as this book, I’ll look forward to reading that too. My thanks to Suzanne Sangster at Head of Zeus for sending me a copy of this book. 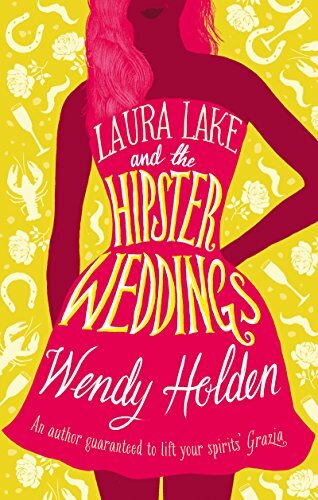 Laura Lake and The Hipster Weddings was published in February in hardback and as an eBook with the paperback due out in September. The Kindle edition is currently only 98p and you can order a copy of that here.